This past weekend AIAS@UTSA members attended the organizations biannual Quad conference hosted, this year, by The AIAS Chapter at North Carolina State University in Raleigh, NC.While there, all attendees participated in a one day design charrette. 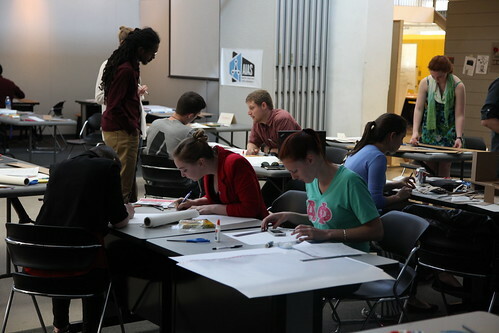 A charrette is a rapid fire design contest intended to make students think creatively about a subject matter and produce an iteration of a design within a time constraint. AIAS@UTSA member and Studio Culture Chair Michelyn Smith was on the team responsible for producing the winning design. Herself along with two other student designers from AIAS Georgia Tech and AIAS University of North Carolina Charlotte were recognized during ceremony by a jury made up of, professionals, NCSU faculty, and Ms. Robin Abrhams NCSU’s Dean of the College of Architecture.